Set within the stunning Dominican countryside, the recently refurbished Louis Villa offers you all the facilities you will need to make your stay comfortable. 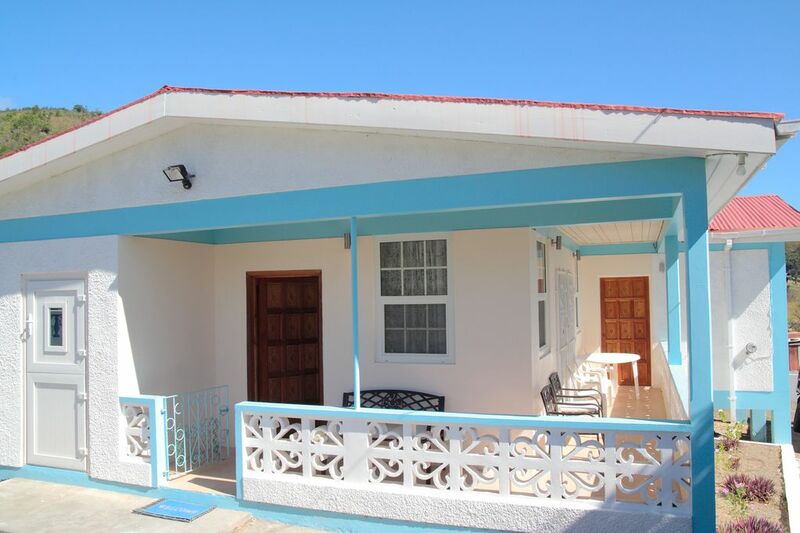 A single storey, three bedroom, fully furnishedm self-contained villa, set in the hillside with a sea view. The Property has a lounge with patio doors, leading to veranda on both sides, cable TV telephone to receive incoming call, Wi Fi internet and stand fans. Separate dining area, fully equipped kitchen with washing machine utility room with ironing board. Three bedrooms - one with a king size bed, second with a double bed, and the third with 2 single beds. Two bathrooms the large room has hot and cold water shower facilities and the smaller has cold water shower facilities. Insect screens are installed on all windows and mosquito nets are available if required. The Villa is set within its own tropical garden. The Villa is a 5 minute drive or a 20 minute walk away from Salisbury Beach. Also, very close by is Mero Beach, where you will find many beach activities. Our parents came to the UK in the fifties and we were all born and live in London. We have been going to Salisbury Dominica on holiday since 1973. Our parents worked very hard in the UK and retired to Salisbury Dominica where they were surrounded by loving family and friends and we wish to follow their journey through life. Both rooms have a large shower, toilet and wash basin. Close to Salisbury going west, is Mero Villa it has a number of restaurant and bars on the beach, and its beach is ideal place for lounging around, also the sea is wonderful to swim in. It is a great villa for a day out which is 10 minutes away from Salisbury by car. Ideally located, clean, well equipped, and local agent excellent. Perfect for our stay on Dominica. We were late arriving but a call to the local agent, Joe Scott, meant he stayed up to greet us. Joe provided support throughout our stay and was on hand and friendly at all times. The villa was well equipped, with washing machine, toaster, microwave and music centre. There were plenty of fans and all beds had mosquito nets, although the area isn't too bad for mosquitos. Fresh mangoes and avocados straight from the trees when we were there was an added bonus. The villa is 5 min along a track so a 4WD is a good idea - which we had as we were working - and not a bad idea for Dominican roads generally. Definitely stay there again when working or on holiday. Terrific! Thank you Mike for your wonderful review. I am pleased to learn that you and your friends enjoyed staying at the Villa and the garden. Also that Joe Scott was so helpful. We look forward to you and your friends staying with us again. The house was a little out of the way for what we originally wanted to he close to but after two day we enjoyed the drive to roseau and surrounding areas. Scott, the point of contact there was always available to assit in any way. Overall our trip was outstanding...thanks to Scott and the many pleasant people we met that made our dominica trip outstanding. Thank you for your review. Scott told me that you and your were having barbeques almost every night and I am pleased to hear that you all enjoyed your holiday in Dominica. Nous avons passé une excellente semaine en Dominique chez Gloria. La maison correspond parfaitement a la description. Les moustiquaires aux fenetres sont un vrai plus pour eviter les moustiques. Joe a toujours été là pour nous aider. Toujours prevenant sans être trop présent. Nous avons eu a subir une onde tropicale et donc une coupure d'eau. Le systeme de pompe mis en place a parfaitement fonctionné. A aucun moment nous n'avons manqué d'eau. Thank you for a great review and I really appreciate your comments about the water pump. made reservation changes without a hitch. Mr. Scott met us in the evening with a smile and a welcome package in the fridge from Ms. Louis. When we needed a blender he brought his own over and two days later.....Bing a brand new blender and another fan were delivered. Ar'cha was there everyday with any fruits or vegetables we mentioned we wanted ready to offer help on any project I was doing or help me find any item available in Salisbury. When the wife wanted a hairdresser he made two appear like magic. Everything we need is in the house or Joe or Ar'cha will get it. We plan to return again. Excellent Villa. One of the most well equipped villa's we have stayed at. Virtually everything needed in the kitchen was already there. Every room with it's own fan a big plus. And for those who need a variety of bed firmness to achieve comfort could find at least one bedroom with a comfortable mattress. Plenty of sheets, and towels and with two bathrooms. All essential grocery items could be found within a 3 minute walk, for those without a car.